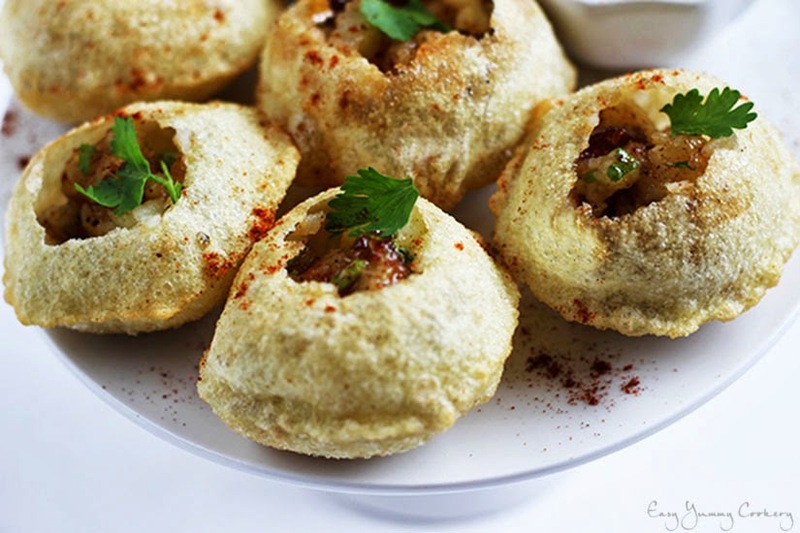 Pani puris, most commonly known as Golgappe in Northern India, is an indian street food. They are usually consumed at breakfast times, but I would think the timing is subjective! The 'puris' (Indian bread) are round, hollow and crispy, while the 'pani' (water) is made from a tamarind and mint paste. The puris are sometimes stuffed with potatoes and chick peas. 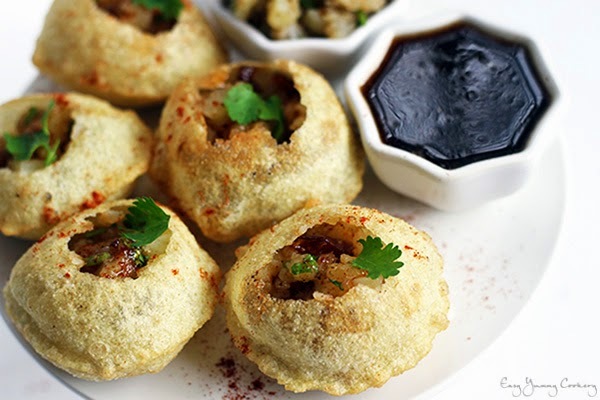 What's amazing about pani puris is that, they have a distinctive tangy, spicy and sweet taste. Your taste buds are going to get tingled with these! 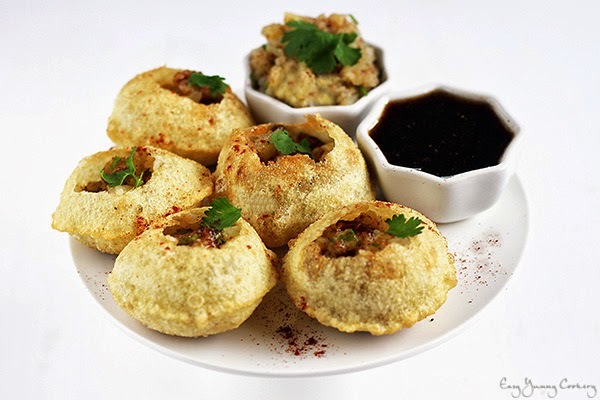 Homemade pani puri is a little bit of a task, so please go through the whole of the recipe and the note at the bottom before having a go at it. 22/03/14: I have made Pani Puris for a couple of times now! 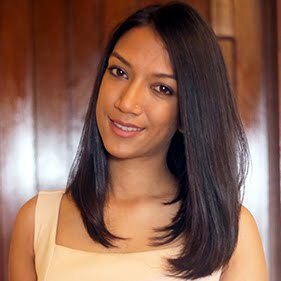 One of my Sister-in-Laws who is half Indian and half Mauritian told me to add baking soda to make the puris puff better! And honestly it worked like a charm! So, if you're tired of watching Bollywood Actors eating Pani Puris in Indian Movies (I hated those times!! ), try your making your own at home with this easy to follow recipe! And feast on crispy semolina shells stuffed with flavourful potatoes dipped in spicy, sweet and sour 'pani'! Find a recipe for a tamarind sauce too! In the meantime, prepare the dough for the puri. Mix with a spoon (or using your hands if you prefer) the dry ingredients for the puri. Then add a little bit of water (say half the amount) and mix well. Then, add the remaining water little by little to form a soft dough. Knead for a few minutes. Then, cover with a damp cloth (to prevent the dough from drying out) for about 10 minutes. Meanwhile, if the potatoes are not ready yet. prepare your tamarind/mint pani. Combine, all the ingredients together except the water in a blender. You want to add a little bit of water to the ingredients to ease blending. Blend until you get a fine paste. Once you are done, strain the paste and add the remaining water. You can always skip straining unless you want a clear pani. Update: If you want to make the Tamarind Sauce, in a skillet heat oil on medium heat. Add all the spices - cumin powder, garam masala, asafoetida, cayenne pepper, coriander powder and ginger powder. Let roast until fragant. Add the water, sugar and the tamarind pulp. Let simmer on medium low heat for 30 minutes until thick or to your desired consistency. See note. If you are done with the pani, remove the potatoes from the hot water, let cool down and get back to your dough. Make small balls from the dough, like around 30 of them - 1" in diameter. Cover with a damp cloth. Then, take one ball at a time, press with your finger to make a round shape and flatten with a rolling pin. Heat the oil in a deep bottom frying pan on medium high heat. Perform a test with a puri to see whether the oil is hot enough for frying. If the puri comes up right away, you should know that the oil is at the right temperature. Fry the puris, allow them to puff, and turn over. Once light brown, put the puris on a paper towel to absorb excess oil. Let them cool down. To prepare your stuffing, peel the potatoes and cut them in chunks using a fork. You do not want to mash them up! Add the chaat masala, the ground chilli powder, chopped coriander and salt to suit your taste. Mix well. Place the puris in a large plate, take one at a time and make a hole in it and stuff in the potatoes and dip in the tamarind/mint sauce..and that's it! For the stuffing, if you want to add chickpeas to your potato stuffing, you can boil them together and proceed with the mixing of ingredients. An authentic pani puri recipe calls for black salt, nevertheless, my luck went vain in local stores but if you have some black salt available at yours, add it to the 'pani' ingredients. Do not substitute the salt for the black salt but add it to the other pani ingredients. I am using only 1 chilli (which didn't really taste hot) but do not hesitate to add more to suit your taste. If you tend more to the mint taste than the coriander one, swap the amounts. The tamarind sauce will thicken a little more when cooled, so do take that into consideration when trying to reach for your desired consistency.